It is already a couple of months ago that an Italian friend of mine returned to Bonn to pay us a visit. We met up in the local vegetarian restaurant for a coffee and some catch up talk on our busy lives. Between a gossip, a complaint on our social life or our studies, she mentioned that she was guest at a couple of good friends and old colleagues. To thanks them for their hospitality, she asked me to prepare a traditional Sicilian dinner for the four of us. 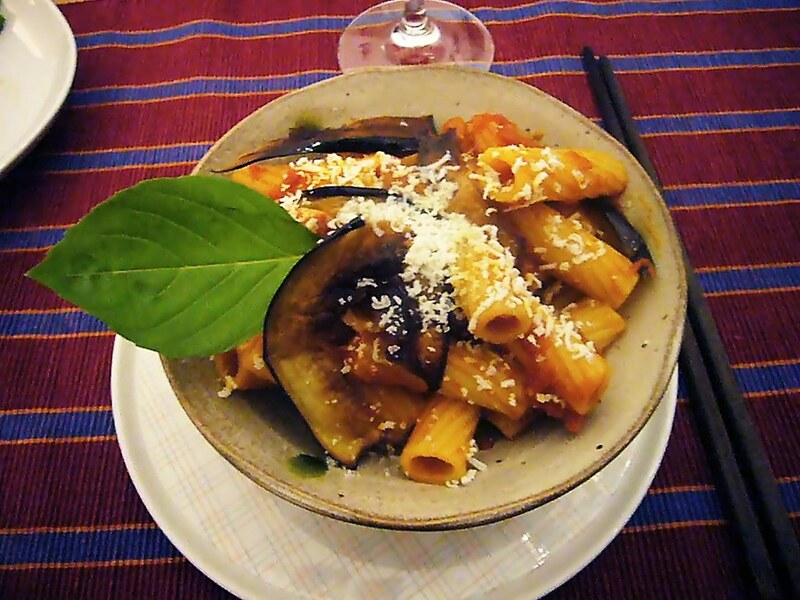 I put together a very simple menu that required minimal cooking to do ahead of time and showing fresh and fragrant flavours typical of my island and, as it is traditional in Italian cuisine, I have divided the starch from the protein course. 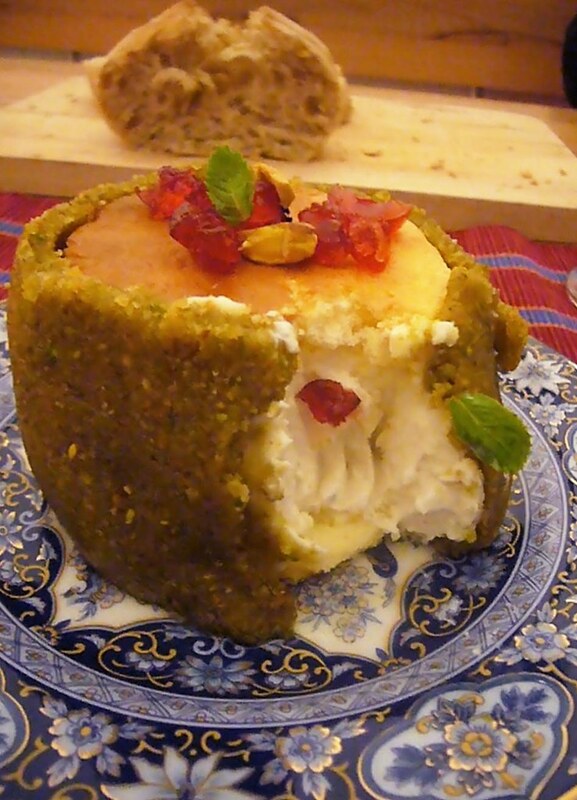 Mini cassata cake with home-made pistachio marzipan. The dinner was great fun to cook; I love to explore new kitchens. This house had a very big kitchen of almost 20 square meters with the cooking island in the middle of the room, facing the long dining table. The fire range was very smartly powered by gas stoves, this mostly due to the intensive wok cooking that this kitchen bears. The kitchen itself was well equipped and I had to bring only few items with me, apart from my knives naturally. We shopped at a closeby supermarket and bought some of the fresh herbs at the local Vietnamese store. The first thing to be done was the cutting; that is the always daunting task when dealing with eggplants and zucchini. Both of them needed to be fried, for the appetizers and the pasta course. While the oil was warming up, in another saucepan the fiery-red tomato sauce was simmering to perfection. Time to put together the dessert; I made the marzipan at home using sugar, pistachios and a bit of water. I needed now to roll it down and find a way to let it stand up as the wall of a cylinder. The top and bottom of the cake was a simple biscuit that I prepared the same morning. As filling I use the classical ricotta, sugar and cinnamon cream to which I added some melted gelatin. To prepare the dessert is always the hardest part of any dinner I have catered. Might that be because I am not so easy to please (esthetically that is)? Anyhow, it is surely the funniest. The dessert is like the crown to your meal, the thing that will linger in your guests mind for long. In this case I ended up folding aluminum paper to obtain a sturdy strip that will act as wall and support the foil of marzipan while it was being filled up. Ideally, these cakes had to have a royal icing topping them but I preferred not to press too much on the sweet pedal and so I crowned the little cakes with some dices of candied cherry and few mint leaves. The dinner went smooth and I was glad to meet the hosting couple. Between one dish and the next one, I even had the time to join them at the table and taste a bit of my cooking. 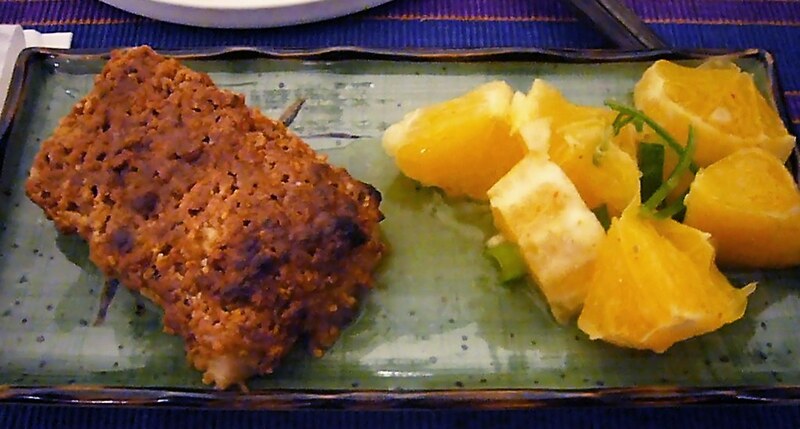 The dinner started with a fresh appetizer of zucchini or eggplant roll filled with minced mint and lemon peel or parsley and orange peel. The tomato sauce had a clear aroma of basil produced by immersing few fresh branches of basil into the warm sauce out of the fire. The fried eggplants gave a touch of meatiness and richness; the bits of salted ricotta instead extra saltiness to balance the sweet-acidity of the sauce. The firmness of the codfish acts as a nice support for the savory crust made with toasted breadcrumbs and almonds, fresh thyme, lemon peel and few black olives. The orange salad was fresh, sour and spicy thanks to the chili flakes and green onions. Extra-virgin olive oil acts like a cement bringing everything together. This salad is a staple in Sicily during summery months and it gives its best when eaten with fried dishes. The cassata was great and it gave its best with the fresh cappuccino we ate it with. A bit too sweet but this is normal for this kind of dessert; thankfully I had left apart the royal icing. Next time I will have to use caster sugar for the marzipan; the grittiness of normal sugar was a bit too much when compared with the smooth filling. The plating was a bit challenging but once I had a go at it, I really liked the outcome. Being this mainly a Chinese household (she is Chinese, he is German but very much into Chinese culture), I had to use rice bowl for the pasta and long flat dish for the fish. They were beautiful though and the cold green and blue hues they had complemented very well with the strong colors of the food, as the sea complements the rustic heartiness of Sicilian culture. We spent many hours discussing about cuisine, Chinese culture, life in Bonn and concluded the night with a great cappuccino made by one of the hosts and an excellent bottle of dessert wine (if I remember well it was a Hungarian Tokaj). Aha! Is this the orange salad you advised me to make when I was sick in December? This sounds like a really nice meal full of different people and different foods. Also, I like Hungarian Tokaji; I lived in Hungary for four months in uni. Great stuff. Alexxxxxxxxx....what a great spread! Orange is right up my alley & I love the way you used it. Mint too! 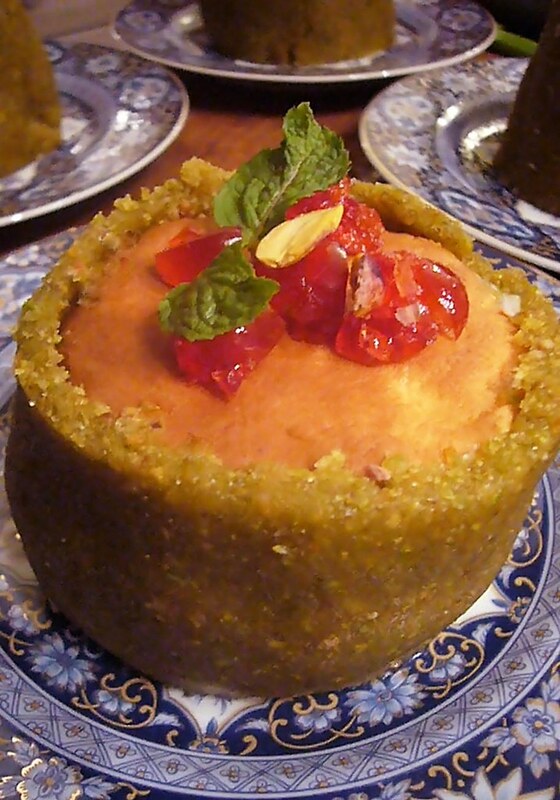 Intrigued by how you built up the dessert, and the riccota within! Pistachio marzipan...YES!! Nom nom nom! This looks like a fantastic menu, I can't believe you made your own marzipan, it looks wonderful. Lucky diners! Looks yummy. I love her blue plates. :) I haven't gone that deep in baking to make my own marzipan. U rock! Belissima Alessio! What an amazing menu. What a delicate feast! Will you write about our Whisky and chocolate tasting as well? You took quite a lot of notes already... See you later, cutie pie!